Discover how to make an amazing brochure with our simple tutorial. In this tutorial we’ll cover how to make an amazing brochure using Adobe Photoshop. It will walk you step-by-step through creating this actual brochure. You can apply any of the tips and effects to your own brochure for a look your customers will notice. Begin by downloading a layout guide from PrintPlace.com found on the brochure product page. We’ll be using the 11 x 8.5 tri(letter) fold layout guide. When you unzip the folder, you will notice a variety of files to choose from. You can choose either landscape or portrait. For this tutorial we will be designing just the outside of the brochure that includes the front cover, back cover, and insert panel. You must design the outside and inside in separate files before submitting your artwork for print. So for now, grab the 11 x 8.5 outside landscape layout jpeg and hover it over the Photoshop icon to open it. With the layout guide open, you’ll notice red, blue, and green lines bordering the layout as well as vertical dotted lines. The red line represents bleed. Bleed is artwork such as background colors or images that extend farther than the trim edge of a print document. The blue line represents trim. Trim is the final size of your brochure after it has been cut. By extending your design past the trim line all the way to the bleed line, you’ll ensure there are no unprinted edges. The green line represents the Caution Line. Anything such as text, logos, or important parts of a photo should not extend past this line. The vertical dotted lines represent brochure folds that separate each panel. Now go to “Image” then “Mode” and make sure “CMYK” is checked. This will ensure color accuracy in the final print. Now is an excellent time to save your PSD. Make sure you save periodically along the way. Now you’re ready to start designing. In this part of the tutorial you’ll learn a quick Photoshop technique to achieve the water color photo effect. First though, we need to create a background. Create a new layer and fill it with a solid color. I’m designing this brochure for a greenhouse so it includes a soft, pastel green. You should choose a color that best suits your business though. Now choose a large photo with a texture that you like and place it over the layout guide. Notice that the photo must extend past the bleed lines to print correctly. Now go to “Image,” “Adjustments,” and then “Desaturate.” Make sure the photo is above the green layer then change the blending mode to “Darken” and change the opacity to 50%. This creates a nice tinted effect on your textured photo. This is where we’ll start creating the water color effect. By creating this layer mask you’ll be able to erase the edges of the photos in a non-destructive fashion. With your paintbrush, choose a brush head such as the rough round bristle brush and make it fairly large. Set your opacity to around 40%. Choose white as your primary color and black as your secondary color. Now, using white, begin painting to reveal the photos beneath. Essentially, white reveals the image and black covers it up. If you make a mistake, simply switch to “black” and paint the area back in. To see the layer mask, hold down the Alt or Option key and click the mask. Click the same way again to see your photos again. The key to creating the water color effect is using a variety of brush heads, sizes, and different opacities. Take your time and experiment to get something you like. Now all that is left is adding your text. Repeat these steps for the backside of your brochure and you’ll have an amazing piece in little time. Then under “Adobe PDF Settings” choose “PDF/X-1a:2001.” Then click “Save PDF.” This is the file to submit to PrintPlace.com for printing! Design your own brochure. 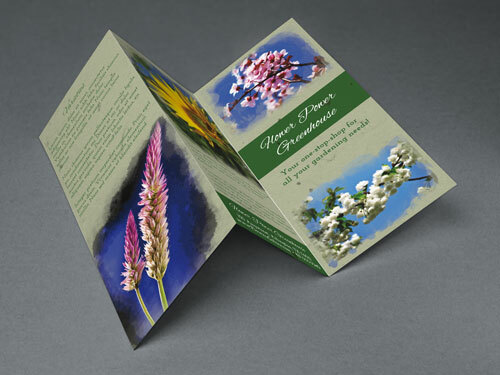 Then discover all of our brochure printing options.